Physics Education: Research, Assessment, & Poverty – Teach. Brian. Teach. This is excellent. Thank you. Much of my interest in PER has been spurred by these kinds of questions. Every other year, I teach both our calc-based and algebra-based intro courses, and the populations of students are very different. If PER is going to be as valuable as possible to as many people as possible, we need to address these differences. Are there specific issues/topics/concerns that you would like PER to address? I want to see a comparison of learning between the different populations. Much of what I have access to that was developed by the PER community was tested on students in calc-based classes at R-I schools. I don’t have much comparative data on what effectiveness the different methodologies might have with students in different educational settings. In my work, I’m starting to address this by collaborating with researchers at an R-I school, so that we can perform the same studies with our students. Truth. I’m curious what kind of grant do you see here? Agreed. 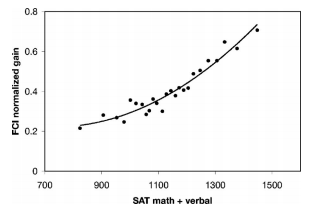 Effect size is likely the way to go here. I also think we need to report raw (achievement) scores in addition to whatever gain measure. One question remains—why are students taking algebra-based physics? It is almost certainly not for a physics or engineering degree. What do they gain? What do they hope to gain? If it just a check-off box on a list of requirements with no pedagogical value to the students, is there any point to measuring how well students learn? 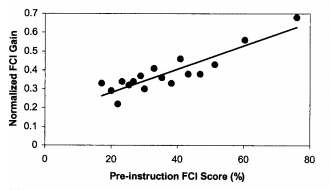 If there is a point to their learning the subject, is the FCI the appropriate measure for their objective? I took a algebra-based course in HS and then took AP. So at least some students go on to be physics majors, etc. But your bigger question is, what should purpose and goals of these physics courses be? If the purpose and goals are different, how would we know we were doing a good job? Those questions, I agree, are extremely important. What are your thoughts? I don’t know their purposes or goals. I agree that high-school algebra-based physics is often a good entry point for students to go on to physics in college (my high school did not offer calculus-based physics, and no high school in Santa Cruz County does). Algebra-based physics at the college level is almost never a preparation for further study in physics and engineering, though, and teaching it as if it were could result in poor choices of content or pedagogy. For most students it will be the last time they learn physics, not the first. I had a similar problem in designing a circuits course for bioengineers, and ended up emphasizing the things that they were being taught electronics for: to get design experience (thinking like an engineer) and to build circuits that were actually relevant to bioengineers. This meant that the course centered on the labs, not on the math (the way traditional EE circuits courses are taught). I tell my students the purpose of the algebra-based physics course is to teach them about problem-solving. Physicists approach problems differently than folks in other disciplines, and I think that’s why they take it. Secondarily, there are plenty of people who need an introduction to things like forces, kinematics, etc (athletic trainers, often biologists, theater technicians, etc), who will never take a calculus course. We have to meet them where they are, I think – expecting people who struggled to pass algebra to make it through calc is unlikely. I’m not sure that the “problem solving” techniques really show much transference—the math folks have been arguing that one for decades, without much in the way of experimental validation. More direct problem solving instruction might be more valuable for that goal. The better argument is that some people need some understanding of forces, without needing (or being able to master) calculus. Identifying why they need to know this, and what forces are of interest to them, could go a long way towards selecting more compelling demos and lab exercises. One way way researchers can respond to these important issues is to take NSF’s “Broader Impacts” pressures seriously. NSF now asks us to emphasize diversity issues more strongly in our proposals (Broader Impacts is its own section of the narrative), gives us incentives to serve underserved populations (such as extra money if your proposal includes TYCs), and requires reviewers to evaluate proposals in terms of their broader impacts. NSF’s self-study of past measures along these lines suggests that they have made a big difference. That’s a good point. Do you think grants focusing on TYC just haven’t made their way to publications where Steve is looking? Brian. Is the algebra-based population being larger than the calculus-based population the norm across the US? Of the schools at which I have taught or been a student, only one of the three was a situation where the number of algebra-based students outnumbered the calc-based ones. Our biology students are required to take calculus-based physics, so we have 2 streams (one for physicists and engineers, the other for biologists). There is an algebra-based physics, but it is primarily for humanities students. The physicist/engineer course is taught once a year, as is the algebra-based one, but the calculus-based one for biologists is 3 times a year. I think the US percentages were 33% calc, 26% algebra, and 12% conceptual for 4 year institutions, and rest were two-year colleges. I’d assume more algebra-based physics and conceptual in TYC than calc. But unsure. We have around 200 ABP and around 40 CBP each semester. Pingback: Disaggregation of Learning Gains–Please Argue with Me | Teach. Brian. Teach. Pingback: Aggregating Three Posts on Research (and the FCI) | Teach. Brian. Teach.